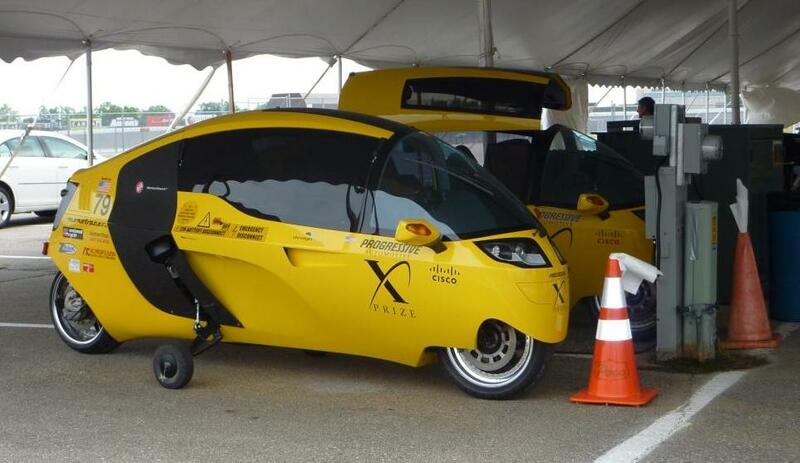 Today we competed in the third part of the X PRIZE Finals efficiency test, the 90 mile highway portion. All went well and I stuck to the minimum trace speed staying behind 5-times-Le-Mans-winner Emanuele Pirro in his Edison2 Very Light Car #95 who clearly knew what he was doing. We always pushed the E-Tracer #79 powered by an AC Propulsion drive system to the starting line and back to the charging impound in order to not waste a single watt-hour. Tomorrow morning (Friday, July 23rd, 2010) at 10 am, we should receive the results. I predict the E-Tracer #79 got well over 200 MPGe. If not, I will never push the thing again as I was already achieving 188 MPGe during June’s Knockdown Stage efficiency tests. On Friday afternoon from 2 to 3:40 pm both E-Tracers will run the 100-mile-range event together at 60 mph. Watch it live on the web! Peraves E-Tracers #79 and #72 Charging after the Efficiency Events. This entry was posted in PIAXP X PRIZE and tagged AC Propulsion, Efficiency Tests, PIAXP, X PRIZE. Bookmark the permalink. You’ve done very well, Rotsch. After watching the data recording, I’m sure you’ll achieve 200 MPGe. Jim looked quite exhausted after pushing 7009 to the start. Gerold. Wir drücken alle die Daumen und sind zuversichtlich, dass ihr zusammen mit euren E-Tracers das Unmögliche möglich macht. -Happy Landing! Unfortunately, i failed…sort of, anyway! It seems that the BRUSA drive has finally found back to it’s claimed efficiency, because Felix, who always was a bit faster in the urban and highway test than me in the ACP-E-Tracer, got 197 mpge combined while i struggled to get a better result with 191 mpge. I also suspect that the reductive charger of the ACP could be the source of the loss of efficiency. while the dashboard really showed exciting values (63 whr/km or 101 whr/mile or way over 330 mpge at the highway test) the real amount of energy that went through the meter at the charging post was 13,6 kWh for those 90 miles, which is 151 whr/mile. if we deduct the “coal factor” of 10% which PIAXP applies, we end up at 135 whr/mile or a total loss of charger and battery of 35%. i know the NeuEnergy cell runs at over 98% from our lab tests, so at the lousy 207 Volts and 24 Amps we can draw from the grid here we have a loss of over 30%??? is the dashboard wrong? this can’t be true, something is definitely wrong. imagine running a system at 5kW and loosing 1,5 kW in form of heat. the fans would be working overtime. we will find out someday. for the moment, i have made my own conclusion: i’ll NEVER push the thing to the starting line again, i will DRIVE…!